Please scroll down for more photos after the article. 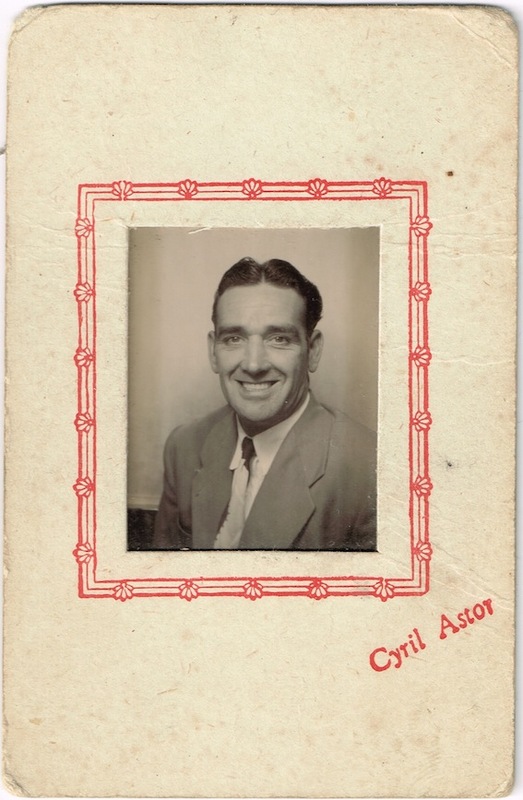 Cyril Astor ran a photography business that was exclusively dedicated to photobooths. In partnership with a Mr Leach, Cyril hired out booths to tourist venues and special events,as well as having a number of booths in permanent locations. The business no longer exists but was located on Cefndy Road Industrial Estate in Rhyl in the county of Denbighshire in North Wales. Rhyl is a seaside resort town and an ideal place for booths that supported the local tourist industry. 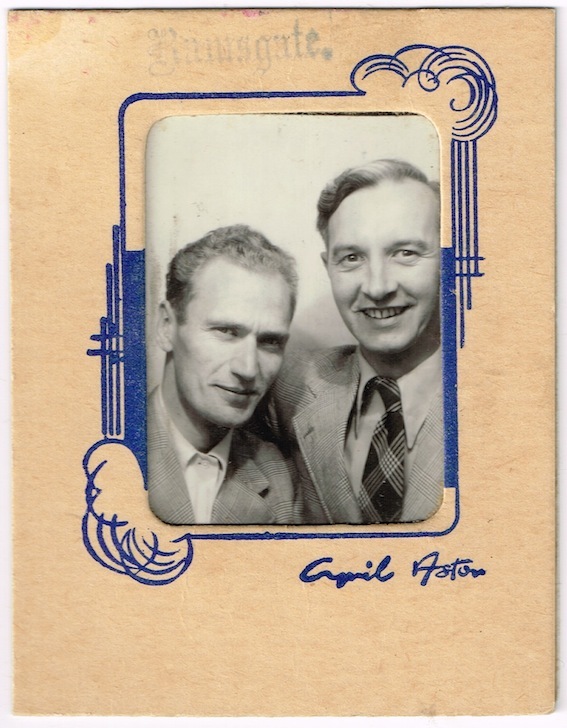 I was unable to find a record of when the business started but his booths were used at the Cardiff venue for the Festival of Britain in 1951, so the business was in operation at that time. In 1972 the business still existed when Irish lass, 20 year old Patsy Furber worked there. 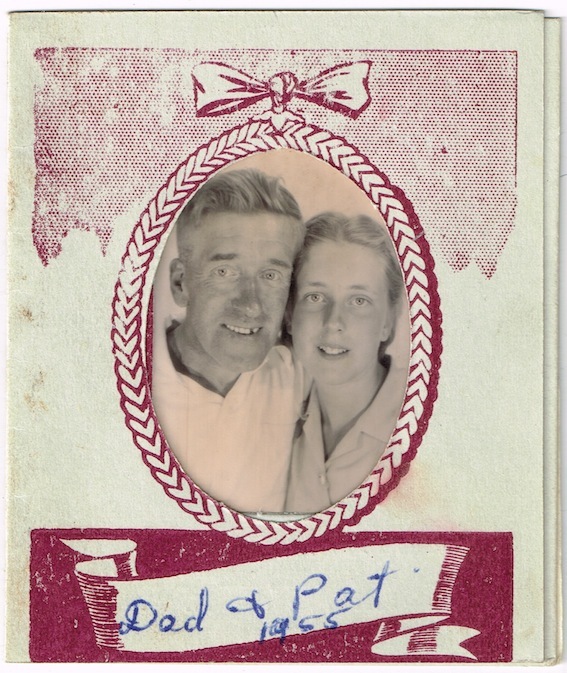 I am very grateful to Patsy for her help in my research for this post. “The managing director was a Mr. Leach, the manager was Gwyn. Mr. Leach’s secretary was Cathy and the telephonist and office worker was Nerys. I was a shorthand typist and part of my job was to type order forms for the chemicals they needed for the booths. 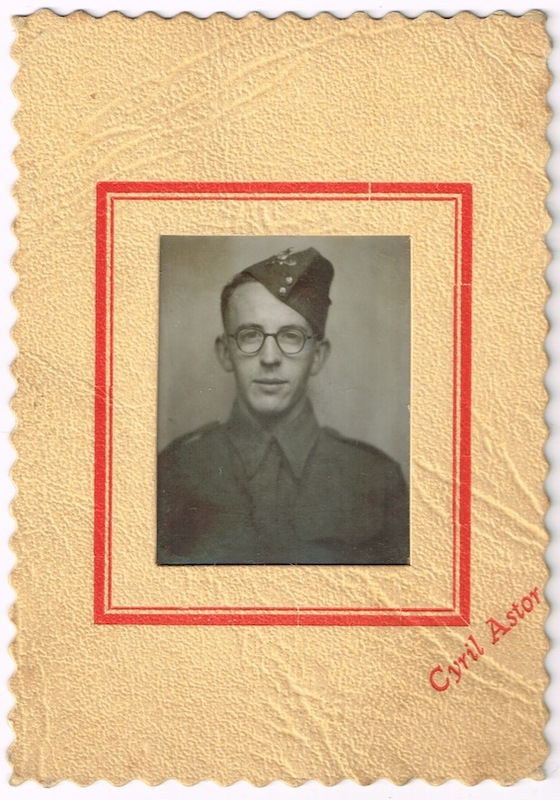 I liked working for Cyril Astor’s business in the beginning but left with extremely bad feelings. I come from Belfast, Ireland and I am afraid I fell foul of political bullying caused by misinformation given by the Special Branch Police in Wales. Mr Astor had booths in Margate (UK), Ramsgate (UK) and Rhyl in Wales. One of the prime spots for his booths was on the ‘Great Orme’ in Llandudno in Wales. 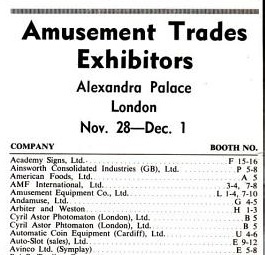 Without Patsy’s help, it was difficult to find information about Cyril’s business but I did find that he was an exhibitor at a trade fair at Alexandra Palace which was advertised in Billboard magazine on the 26 November, 1966. Presumably this event promoted his booths for hire. In addition to being a photographer, Cyril was an inventor. He made a patent application in 1966. The Patent Index says that he applied for patents to make improvements to the Photomaton machine in the early 1960s. 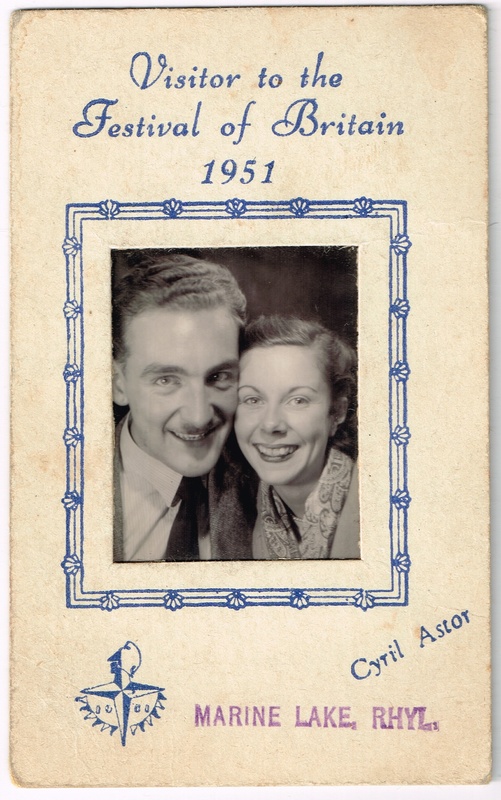 On the back of each of the cardboard photo frames it says, “Photographer: Cyril Astor. 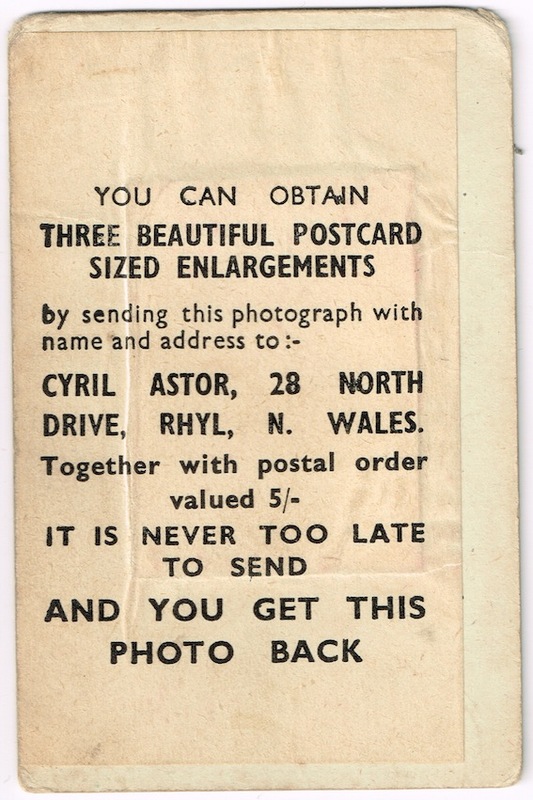 You can obtain three beautiful postcard sized enlargements by sending this photograph with name and address to Cyril Astor, 28, North Drive, Rhyl, North Wales. 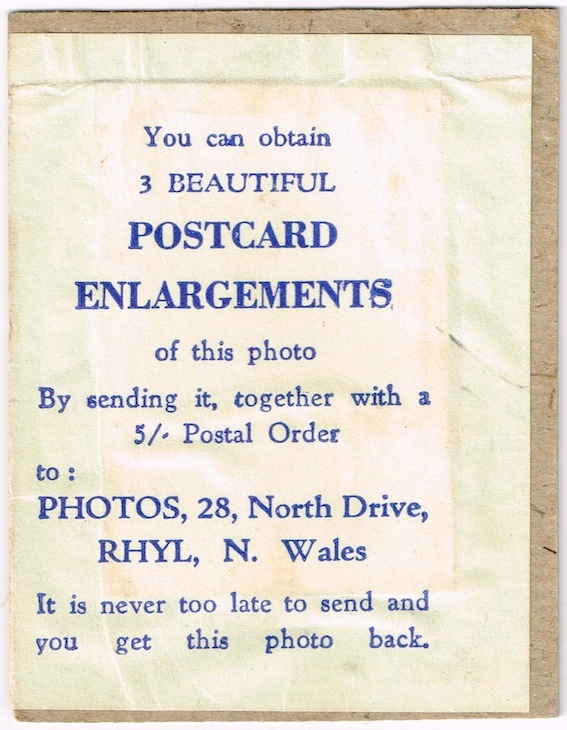 Together with postal order valued 5/-. 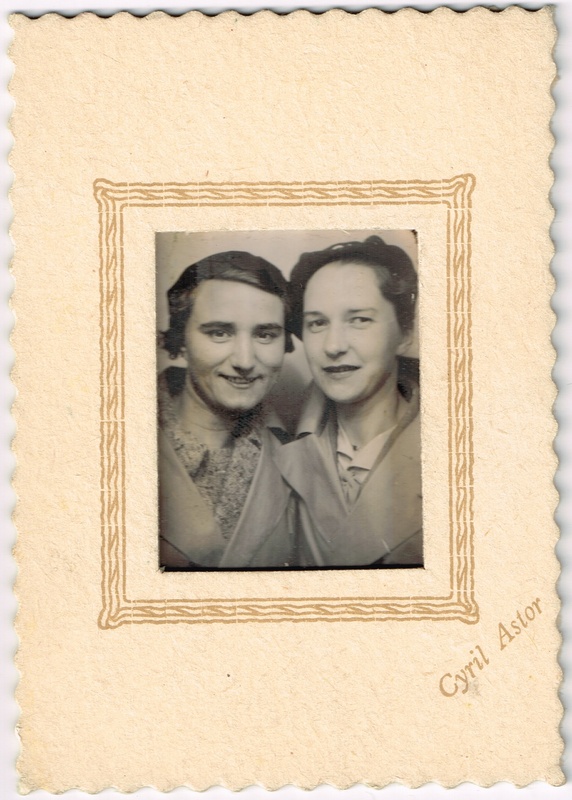 It is never too late to send and you get this photo back.” Of course it is too late now, despite the claim, but it does make me think there could be some fabulous photobooth postcard gems out there to be discovered! 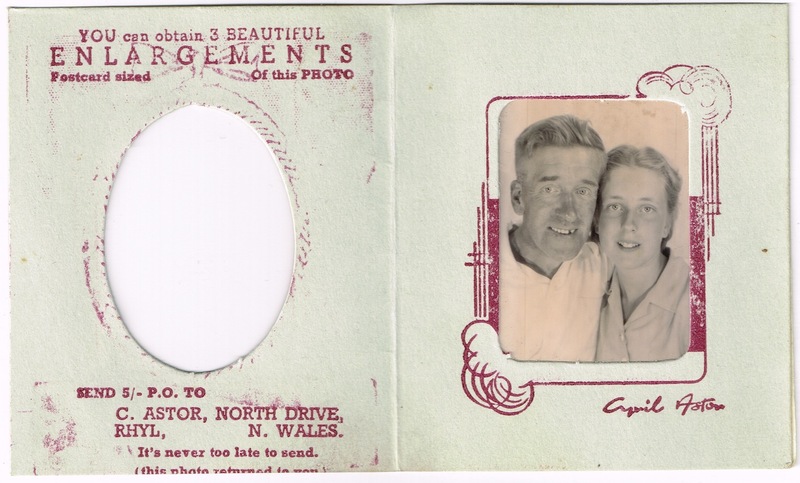 Printed on the backs of the father and daughter pair (above) is Cyril’s standard advertisement. Thanks Martin. Yes, seems like she had a tough time. Glad things have changed, at least on the surface. My sister and her family live in Ireland and up north she says the tension is still boiling away under the surface. Great photos, always gets my imagination stirred. Wonder where they or family are today. I had no idea tensions are high in Ireland. I think they are never far from the surface, according to my sis. They have done very well to get things stable again. I am hoping it stays that way but the issues haven’t gone away. Quite a bit here, including your great research and wonderful narrative. I am struck by the quality of the photos, as well as the politics that never seem to stop festering. Toss in a some religion and there goes any chance at reason. Excellent post, very nicely done Katherine. Thanks Mike! It was a labour of love and took me almost 2 years to finish! Oh, what a wonderful story. Great, great post! Wow, thanks so much. What a lovely comment, Alessandro!!! You are definitely a ‘Photo Journalist’ (pun intended)… and this excellent post shows why. Your layout and information, so well done. Interesting comments by Ms. Furber. How did you ever find her? Hi Ted! Good question. It was a long time ago but I think I found her on Google +. 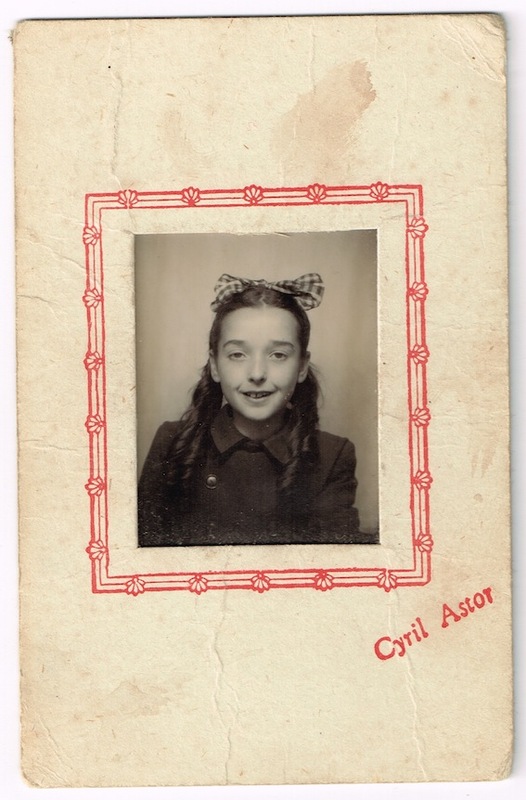 I think she had listed Cyril Astor as one of her previous employers. Thanks for the compliments about the article. It was a labour of love! Thank you Eileen. That is wonderful information. So you were a baby in the photo but who were you with, if you don’t mind my asking? I am being held by my Mum and I must have been around 6 to 9 months ago, so I think it must have been 1947. Wish I knew if it was taken at Rhyl. I sounds like a gorgeous memento! Thanks again for helping to expand my knowledge of Cyril’s studio. I’d say that is possible, but I’ve not come across any mention of Cyril having Scottish representation for his business, in my research. Could they perhaps have taken a holiday in England or Wales?